Holding myself accountable: first week of study and already my to-do list has cracked two pages. My last post was about general future aspirations. Since then, I’ve had my first classes for all four new publishing subjects. Most of the assessments’ due dates are still weeks off, but the course guide and class discussions have provided a glimpse ahead. This year’s assessments are meatier than anything that’s come before and so it’s in my best interest to stay organised. In the past, I’ve neglected difficult assignments until their deadlines became close enough to bite me on the arse. Rushing assignments is unwise; not only does it cause stress, but the marks you’ll receive won’t be indicative of your true ability. Common Sense 101 says you’re guaranteed to achieve better marks if you patiently pore over your work for a longer period. With this in mind, I’m endeavouring to make small, frequent progressions on my assignments. This way they won’t fester and become monsters. I may yet write individual posts about these assignments, as some sound interesting (design your own magazine!). This year’s assignments will undoubtably help me improve as a writer. Almost all of them can be approached with degrees of freedom and creativity. Consequently, I’ve found ways to incorporate them into my general writing goals — there are no assignments for assignments’ sake! Interestingly, this year our personal blogs are going to be assessed to make up a percentage of our overall grade. It seems components of NMIT’s Bachelor program have been rewritten to greater prepare us for the still-transitioning digitisation of the publishing industry. An author platform is a veritable necessity these days, so I’m glad we’re being assessed — at least partially — on our own online presence. (Maybe I’m just biased because I’ve come to love blogging.) However this year goes, I think this is inarguably an exciting time to be studying publishing. Here’s to keeping our goals small and manageable. 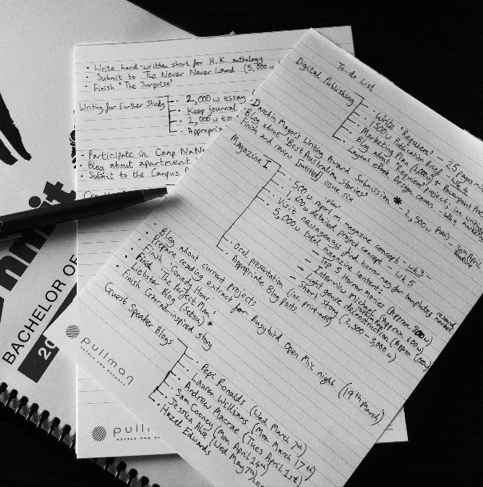 This entry was posted in Personal and tagged Accountability, Bachelor of Writing and Publishing, Blogging, Determined, Goals, Inspiration, Motivation, NMIT, Organisation, Organised, publishing, School, Student Life, Tasks, To-Do Lists, Work Ethic, Writer's Journey, Writing by toconnell88. Bookmark the permalink. This blog is part of an assignment? No. I explained that poorly. I’ve had this blog for two years (been actively posting for a little over one), but this year a small fraction of our overall grades will come from starting or keeping a writing blog. It’s basically the higher-ups’ way of getting us to develop our own online presence (since a fair amount of the class has none). Nothing insidious 🙂 Obviously I’m down for it because I blog regularly anyway. However, this assignment has also inspired me to blog about the industry guest speakers whom we’ve the privilege of listening to a couple times a month. So, yes: part of an assignment. But, no: didn’t specifically create this blog FOR an assignment, nor is any of the content disingenuous in any way (if that was the implication!). Oh man, you are WAY more organised than I ever was (and still am. You do not want to look at my calendar and the stuff I’m trying to fit in there). I admire that. The new subjects sounded so cool. I’m so jealous that you got them. Also so i see you participating in Camp NaNo? Ha! That’s cool. I could never get into those as much. The vibe wasn’t right, but I may try something similar to that. Not sure yet. Will have to check it out. Do you guys have the creative theory stuff this year? I think I remember that getting cut, because that was the worst class ever. Fantastic lecturer though, horrible class! Good luck, man. If you need any help, give me a yell! Yes, I’m participating in Camp NaNoWriMo! Good spotting. You should do it, too. (We can be cabin mates!) It doesn’t carry the same prestige as regular NaNo, but you can customise your project to your own specifications, making it good for shorter-form writings like short stories and novellas. We have Writing For Further Study and Creative Project II, both of which dabble in some creative theory. So far I like all the classes and lecturers, (though I do miss Alice!). Thanks for the help offer. I’ve started having focused to-do lists instead of just working on things as I feel like it, and I find myself much more productive. It is fantastic to see things cleared off the to-do list and the next item tackled. I love a good to-do list. Yours is particularly well organised. Sometimes, if I do something and it wasn’t on my to-do list, I write it on just so I can cross it off. Sad much?! Haha. I do the same! On particularly slow days, I’ll put trivial things like ‘have lunch’ on the list. It’s all about tricking the mind, I suppose!